Some affluent buyers are getting the keys to their new home without putting a penny down. It’s 100% financing—the same strategy that pushed many homeowners into foreclosure during the housing bust. Banks say these loans are safer: They’re almost exclusively being offered to clients with sizable assets, and they often require two forms of collateral—the house and a portion of the client’s investment portfolio in lieu of a traditional cash down payment. In most cases, borrowers end up with one loan and one monthly payment. Depending on the lender and the borrower, roughly 60% to 80% of the loan can be pegged to the home’s value while the remaining 20% to 40% can be secured by investments. On a $2 million primary residence, for instance, the borrower could get a $2 million loan, which would require a pledge of assets in an investment portfolio to cover what could have been, say, a $500,000 down payment. The pledged assets can remain fully invested, earning returns as normal, without disrupting the client’s investment goals. While these affluent clients may be flush with cash, this strategy allows them to get into a home without tying up funds or making withdrawals from interest-earning accounts. And given the market’s gains combined with low borrowing rates in recent years, some banks say clients are pursuing 100% financing as an arbitrage play—where the return on their investments is bigger than the rate they pay on the loan, which can be as low as 2.5%. Some institutions offer only adjustable rates with these loans, which could become more expensive if rates rise. In most cases, the investment account must be held by the same institution that’s providing the loan. While these loans make up a small portion of banks’ overall lending, demand for them has been rising. BNY Mellon Wealth Management’s mortgage team says it experienced a 10% increase in requests for 100% jumbo-mortgage financing involving clients’ investment portfolios in 2012 compared with a year prior. BOK Financial, BOKF +0.54%which offers up to 100% financing just to medical doctors through its private-banking divisions in eight states, including Arizona, Oklahoma and Texas, says there has been a roughly 25% increase (or about 100 more borrowers) in this lending from a year ago. Also, at Citi Private Bank, applications have been growing over the past two years. “Demand is two to three times what it normally is,” says Peter Ferrara, managing director of the private bank’s residential real estate. • Portfolio restrictions. The amount clients can borrow against investment accounts will depend on what the portfolio comprises. In most cases, they can get up to 95% if the account comprises cash, up to about 80% if it’s bonds, and between 50% and 75% with stocks. Withdrawing pledged funds is typically restricted while the loan is outstanding. • Relationship pricing. To get the lowest rate, clients who already have significant assets at a particular bank should consider applying for 100% financing there. • Underwriting standards. Borrowers will still need to pass regular underwriting requirements, including having a high credit score, a low amount of overall debt—including student debt—and providing documentation of substantial income or assets. Text or call 805-419-0925, or email lorifrankfort@aol.com. Browse bedroom ideas, from loft beds to a decorative duvet cover, and dream in style. With the help of a bath designer, revamp your bland bathroom with a walk-in bathroom shower, bathroom sink and a new bathroom sink cabinet. OAuthException: Error validating access token: Session has expired on Thursday, 12-Jan-17 10:26:33 PST. The current time is Sunday, 21-Apr-19 11:57:40 PDT. 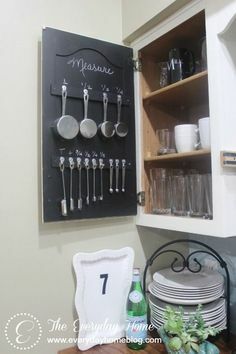 DIY: Organized Measuring Cup/Spoon Cabinet - great DIY on how this cabinet was organized & how the utensils were hung. 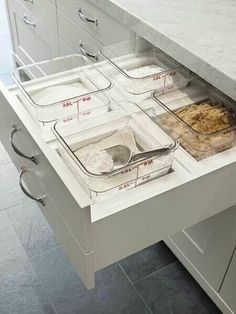 This could be the start of an organized baking cabinet. Copyright © 2014 HomeinDosVientos.com. All Rights Reserved.